The Hong Kong Soccer 7s 2014! The Hong Kong Soccer 7s kicks-off in little under 5 hours with the Rangers Legends leading the way with their first match tonight! As you will all know the Legends are back in Hong Kong to defend the title they won last year, and if they do it will give them a hat-trick of Masters titles! Many of the faces that make up the squad are very familiar to this tournament, but both Dale Gordon & Pieter Huistra will be making their Rangers “Legends” débuts. Certainly the Rangers players are in fine form ahead of the tournament and are looking forward to getting under-way tonight. Soccer 7s Masters Champions 2013! The Rangers Youth team, competing in the main (open) tournament get their matches under-way tomorrow (Saturday) morning. Gordon Durie’s squad is looking good and has a very good mix of pace and skill. The squad includes a few players that have been here before, namely Kyle McAusland, Calum Gallagher & Jamie Burrows. The remainder of the squad are making their débuts in Hong Kong and 8 0f the 10 all played in the very recent Youth Scottish Cup Final victory over Hearts. They will face Manchester City in their group and will hope to repeat the defeat they handed out to them in last years quarter-finals! The other seeds in the tournament include Chelsea, Newcastle Utd, Sunderland, Aston Villa, Leicester City & China’s Guangzhou Evergrande. Scottish Youth Cup Winners 2014! Knock-out stage – refer to Soccer 7s website! Tickets can be bought by paying cash at the public entrance during the tournament. Entry is free on the Friday evening, while tickets for the weekend are priced at $160 per day or $300 for a two-day pass. Lookout for the Rangers flags over the weekend near the press box as this is where all Bears coming along should try and congregate! An update on the Rangers Legends strips. We have only just today taken delivery of them – so talk about leaving things to the last minute! As I’m sure everyone can appreciate it has been a very busy time in the lead up to this week, so for those that ordered customised tops, it is our intention to issue invoices and get them posted off after the dust has settled from the weekend. So please bare with us. For those wishing to order a strip, we will also be re-ordering new tops soon after the tournament, so more to come on that after this weekend. We will be sure to get lots of photos of the tops on here and on our social media sites! Finally all at the Hong Kong Rangers Supporters Club would like to thank all of our sponsors for once again bringing out the Rangers Legends once again. Without their support this would not have been possible. Silver sponsors: AM Capital, RWB, Hong Kong Trading Limited & DRF Consultancy Ltd.
For the record, the Rangers Youth team are 100% paid for by the tournament sponsors and the Rangers Legends are 100% paid for by passionate Hong Kong based Rangers fans within the Hong Kong RSC. 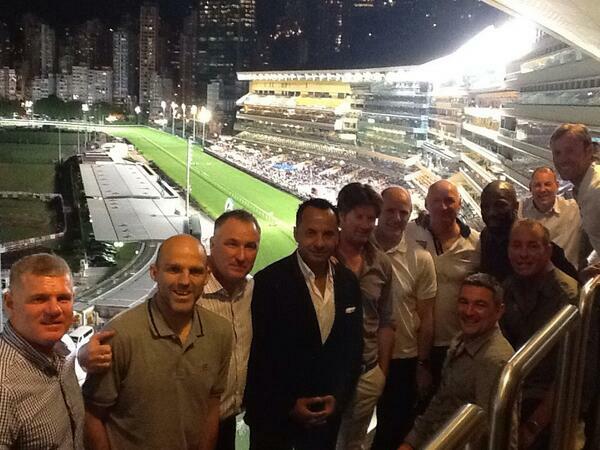 A night at the Happy Valley Races! « A night with the Rangers Legends in El Ciado!